Once upon a time, there was a sweet pitbull named Roo who lived with her mom, who was a student at a nearby university in North Carolina. 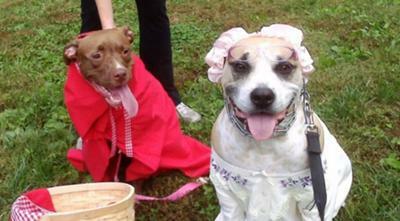 Whenever she went out, the pitbull wore a red riding cloak, so everyone in the town called her Little Red Riding Roo. One morning, Little Red Riding Roo asked her mother if she could go to visit her grandmother, as it had been a while since they'd seen each other. "That's a good idea," her mother said. They packed a nice basket of fresh Snausages for Little Red Riding Roo to take to her grandmother, and she set off into the woods. 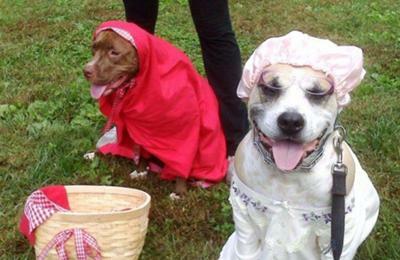 When Little Red Riding Roo arrived at her grandmother's house, she instantly sensed that something was off. Her grandmother's best-loved Kong lay on the floor, filled with peanut butter, yet untouched. The hit show--Pit Boss--was playing on the television, but Grandmother, who never missed an episode, was nowhere to be seen. 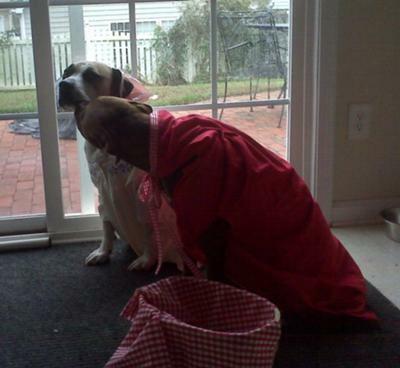 Little Red Riding Roo gingerly set down the basket of Snausages and crept toward the bedroom. "You won't find your grandmother here," came a sinister voice from behind. Little Red Riding Roo whirled around to find herself facing none other than the infamous neighborhood bully, a miniature dachshund named Mr. Binks. "What have you done with her?" Little Red Riding Roo cried in dismay. be the next to go." The portly dachshund snatched up the peanut-butter filled Kong, turned on his heel and began to trot towards the door, his belly dragging on the ground along the way. "WAIT!" cried Little Red Riding Roo. But it was no use. Mr. Binks was almost to the door. With a final sneer, he turned and said, "I hope your grandmother likes the Orange County Animal Shel.." Suddenly, he stopped in mid sentence. An unmistakable gleam crossed his eye. "Are those snausages in your basket?" he asked greedily. Before she could answer, Little Red Riding Roo was knocked to the floor. In a blur, the miniature dachshund dove for the basket and began to wolf down the beef-flavored treats. Little Red Riding Roo saw her opportunity for escape. She threw on her cloak and ran home faster than she'd ever run before. She breathlessly recounted her story to her mom, and before she knew it, they were racing across town to the animal shelter. They saved Grandmother in the nick of time, and the whole dog world relayed the story of the brave pitbull who outwitted the evil dachshund. Mr. Binks ended up needing to have emergency surgery for, as the veterinarian put it, "overingestion of meat byproducts". After receiving the vet bill, his owner decided enough was enough. He immediately put Mr. Binks on the dreaded green bean diet and started taking him to the dog park, where he was forced to play nicely with all the other dogs that came across his path. little red riding hood is adorable she looks so similar to my girl. Good luck! And the story was pretty good too!